My Toronto Carnival Band, Carnival Nationz launched last night ... that was too much to bear, sitting there knowing I was missing what was in store, as comments such as the one below were sprouting across my FB newsfeed. ... And I sat there thinking, "Don't I know it!" ... you see co-band leader DJ Bandit sent me a teaser professional picture earlier in the evening, for a blue section! Talk about feathers ... now these are some wings. When my daughter saw it her first words, "That's RIO!" ... I suppose the cartoon came to her mind and it was then it so reminded me of RIO too! "At Carnival Nationz launch, loving the Hennessey Booth! Night off to a good start!" "Tings lookin' good over here :). Unexpected colour combinations...got me dizzy!" 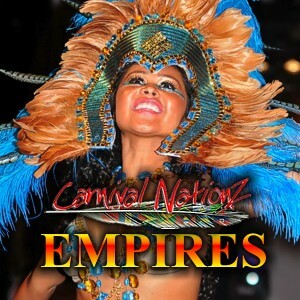 Here is a first look at the Carnival Nationz (CNz) 2012 theme 'Empires' ... click here for more!